I had a question recently about how I process panoramas – so I thought I’d document my workflow using a recent image as an example. This will be a bit geeky. Next week I should have a more normal post after I finish selecting / editing photos from a visit to St. Augustine. I was up on Mount Evans near Denver, Colorado with an Olympus E-PL5 camera and a 24-100mm equivalent lens. This is a 16MP camera and the mountains and valley were just too large to fit through that lens and onto that sensor. I really wanted to capture something that would give viewers a sense of the scene. So how did I make a 46MP (9608×4804) wide-angle panorama with the gear I had? Read on. This is a multi-photo panorama. Many cameras have a panorama capability built-in. I’m not sure if the E-PL5 has it, because I never use it. Why? I like the flexibility, control, and quality I can achieve with a manual process. I don’t like letting the camera decide everything automatically. And I like the result – huge, rich files that I can print large, or even crop to yield several different compositions. In this post, I’ll write about using the software that I have (Lightroom V5 and Photoshop CS6) but the concepts are similar no matter what software you have. You’ll need to interpret / apply this info to your own tools and workflow. There’s four main phases: 1) Capture, 2) Initial Adjustments in Lightroom, 3) Photoshop stitching and processing, and 4) Final Lightroom tweaks. I’ll give you some hints about each. Carefully capturing the input frames is extremely important to the end result. Input variations can be hard for software to handle, so try to minimize differences. You should use manual white balance, exposure, and focus. For horizontal panoramas, shoot vertical frames and overlap them by thirty to fifty percent but not more. Too many frames means more seams, and this could add problems you’ll have to fix. If this happens, try removing a frame – it might not impact the final image. I shoot either on my tripod or handheld. If there’s enough light, I’ve had good luck shooting handheld. I’m careful to keep the camera level and use a grid line or focus mark in the view finder aligned with the horizon as a guide. I always shoot in RAW format, but the stitching will of course work with JPG input frames. It’s best to use a camera / lens supported by Lightroom so that you can correct lens distortions. If you don’t, the distortions can build up across the stitched images and look especially bad when there are straight lines in the scene. I load the images into Lightroom and adjust them all identically. I aim for a neutral, low contrast setting across all images. I enable distortion correction and usually turn off sharpening / noise reduction (and deal with them in later steps). Be conservative with the highlights – I’ve found that stitch software may blow out parts of the image when attempting to blend between frames. I’ll dial down highlights if I have any concern. If I didn’t use manual exposure, I may also try to match white and black points in all the histograms. Once I’ve got the frames adjusted in Lightroom, I open them as layers in Photoshop. This allows me to try different auto align algorithms (under the Edit / Auto-Align menu), undo them, and try again if there are issues. For the wide-angle shots I usually make, the cylindrical alignment method seems to work best. I check the result at 100%. Sometimes the software doesn’t line up the most important parts of the image perfectly and I’ll use the move tool to make small adjustments. Seven source images opened as layers in Photoshop and auto aligned. Next I’ll do the blending (Edit / Auto-Blend). Then I look for variations across the image (most often in smooth sky). You can see the leftmost frame above is a bit darker. If the auto blend hasn’t worked well enough, I’ll undo it and tweak the levels or curves in each layer and then re-blend. Once I’m happy with the blend, I’ll flatten the layers, and then rotate and crop the image. I don’t do final cropping at this point – I save that for the later in Lightroom. It’s OK to leave a bit of white around the edges. In CS6, content aware fill can fix those for you. If you do use Content Aware Fill, review those areas at 100% for flaws. You might need to touch them up with the clone tool. This is also the time to do any other cloning the image needs. Now do your noise reduction on a new layer. I use Topaz DeNoise 5, but other software works well too. I just like the user interface in this plug-in. Check the result at 100% again and decide whether to apply it to the whole image or selectively. Most of the time I add a layer mask to the noise layer and apply it to the sky and / or smoother parts of the image only. This preserves detail where the noise isn’t obvious (ground, trees, etc.). I’ll then merge the layers (shift-alt-command-E) and play around with various filters (Nik Color Effects Pro or HDR Efx, Topaz Clarity, etc.) to get to something close to what I want. Then I return to Lightroom. Final steps in Lightroom are sharpening, any tweaks to white balance, exposure, white and black points, cropping, etc. This workflow takes time. Is every scene worth all this? Nope – I only go through it if I think the final image will be worth it. Even so, sometimes I’ll start the process and stop when I realize that the composition didn’t turn out. You’ll have to decide whether it’s worth the time and effort to you. I hope I’ve given you some insight. Try it yourself and please let me know how it turns out. Even if you don’t go through the whole thing, some of the info might be useful. I’d be happy to answer your questions. The best place to ask them is in the comments for this post so they’ll help others. Thanks for stopping by and reading my blog. Now – go make some really big photos! What a wonderfully clear and helpful exposition! And inspirational, too. It’s v hard to write simply and well, and v generous to share hard-won insights. So a big thank you, Ed! And while, personally, I’m a long way off tackling anything this advanced right now, it doesn’t matter because I’m bookmarking it in Favourites! Thanks for your comment! It wasn’t easy to write. A lot of what I do is second nature and to write it down, I had to re-do the process and make notes as I went. It’s also hard to anticipate the experience level of people reading it. To document every little step would be overwhelming and I worry a little that I left out too much for someone just getting started. But hopefully there’s enough hints to help and something for everyone. Please let me know how it works out when you try it. Personally, I’d say this was pitched just right. Folk interested in trying out, or improving, something like a stitched panorama are going to be familiar with layers, curves, etc – but want to know what’s likely to go wrong at the capture stage, what’s the best order to do things, what tends to work and when… all of which you covered perfectly. It’s inspired me to move on from some ageing Corel Paint Shop Photo software and invest in the much more linked-in and mainstream Photoshop instead, after which I must buckle down and learn it. I hope others read this blog and comment on it, too. As more people discover your site over time, it’s the kind of blog they’ll be really pleased to stumble upon, and, if the Comments section is still open, hopefully they’ll say so! PS I had assumed that Lightroom was a Photoshop product. I meant that I intended to get into the software you have mastered so effectively, and be able to try to copy your techniques and tips. Now I realise it’s from Adobe! I hope I didn’t cause any confusion. Adobe makes both Photoshop CS6 and Lightroom. They do some of the same things, but have strong capabilities that don’t overlap. 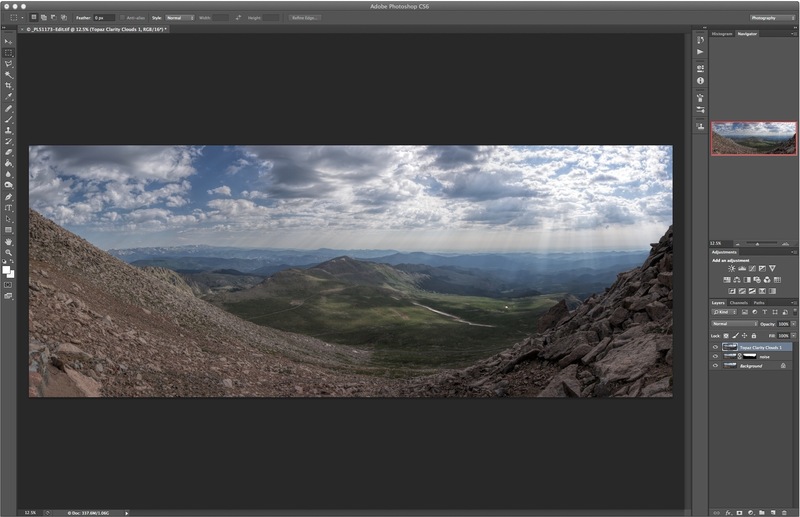 For instance, Lightroom can’t do panorama stitching or layers like CS6, but it can catalog and tag images. I also find it’s easier to process RAW format images and apply changes to multiple photos using Lightroom, although CS6 can do some of that too. Rhona, I think you should look seriously at the Elements & Lightroom combination. Elements is much less expensive and it may have all of the CS6 capability that you’ll need including layer masks. I think there are free downloads of all three that will work for 30 days, and there used to be a discount if you bought more than one at a time. Another thing to look into is the student discount. If you know a student that can buy the software for you, there is a substantial savings. Brilliant Ed. That’s a much better comparison than anything I found. And good tips re trials/ buying together/ student discounts, etc. I really do thank you!